GADSDEN – Mayor Sherman Guyton today announced that the Alabama Department of Transportation has agreed to resume work on the extension of Interstate 759 in Gadsden. “Today is a great day for the City of Gadsden and all of Etowah County. 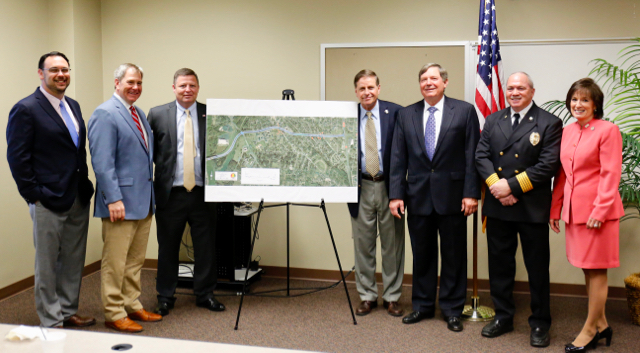 The City has been working with State Representative Craig Ford, ALDOT Director John Cooper, and Governor Robert Bentley to make the I-759 extension project a reality,” said Guyton. Gov. Bentley and ALDOT are committed to seeing this project through to completion. Guyton welcomes the opportunity to continue working on a plan that would connect I-759 to Highway 431. “The project has been my focus since I took office, and I know it's been a focus of Representative Ford's for some time. This is proof that by working together you can make great things happen. Today is truly a great day for the City of Gadsden and Etowah County, resulting in the improvement of our transportation infrastructure. On behalf of the City Council and local residents, I want to thank Rep. Ford for his efforts and Gov. Bentley for his commitment to this project” said Guyton.